I never had a weight problem til after I had my kids. I did not feel confident, I had to take strategic pictures to post on facebook, I could not breathe well while sitting. I could not do any exercise without feeling out of breath. When I went to get a swimming suit for our 10 year anniversary, I looked and felt miserable. I realized I needed a change. I looked at before and after pictures of women who had done this before, and came across some amazing photos and decided that if they could do it so could I. In the first week I lost 5 lbs and 11 in the first 2 weeks!! I was so motivated!!!! the first two weeks of not eating bread and sugar and junk were the hardest. NEVER! I honestly was so tired of where I was that I never felt like giving up! I wanted to lose weight the healthy way more than I wanted anything else at that point in my life. What kept me going was my goal. My desire to feel and look better! I actually did not have a plateau. Once I changed my eating the weight kept falling off. at the time I ate whole unprocessed foods and lots of veggies and fruits, and lean proteins. that was completely different than the fried foods that I was eating. not even compares!! haha. I was a couch potato. Now I go to the gym everyday. Eat less than you are burning. Wow !!! Way to go. Never give up on your dreams. My husband does everything he can to sabotage me trying to lose weight and to be healthier. Wow Wee! You go girl! I’m turning 50 this year! 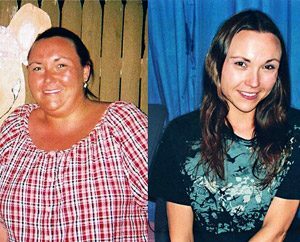 I have always been a size 8/10….After a long 2 year illness and my sister and mom passing away (within 24 hrs)…I gained weight. ..now a size 14. Makes me sick! I eat very healthy but when it comes to exercise. …hate it! I make every excuse to not do it….is there a way to get the pounds off without exercise? Wow! This is amazing Becky Lopez! Definitely motivation for us! She looks fabulous!! compliments , good job !!! Me too… I am tired of being fat and I am on my way to losing 70 lbs also…!! Great Job..!! wow! she looks very pretty now!